James Broderick Design Blog: Sentry Turret Project I - Arrrggghhhhhhhhh the colours!!! Sentry Turret Project I - Arrrggghhhhhhhhh the colours!!! New project time! This will be our first solo project of the year and the brief is to design and model a sentry turret that can be used in a Unreal 4 blueprint system which is set up to turn to follow the player, tilt and fire projectiles. 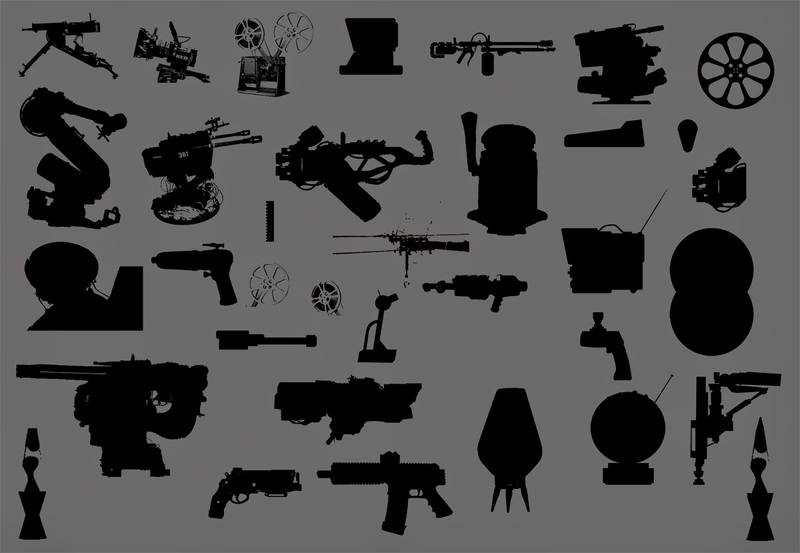 I had a couple of ideas floating around before and during this ideaboard: one idea was to have some sort of briefcase that folds open into a sentry turret, I also had another after collecting the images of having some sort of projector or camera that has been adapted into a disintegrator ray but I still wasn't committed to the idea. I started to find a load of really colourful 80s imagery and it brought me to my next idea which involved one of my favourite things: Lavalamps. I was thinking it would be cool to have some kind of turret that could shoot out exploding lavalamps or massive lava blobs of death which would really give me the opportunity to play around with colour and the particle engine in UE4. 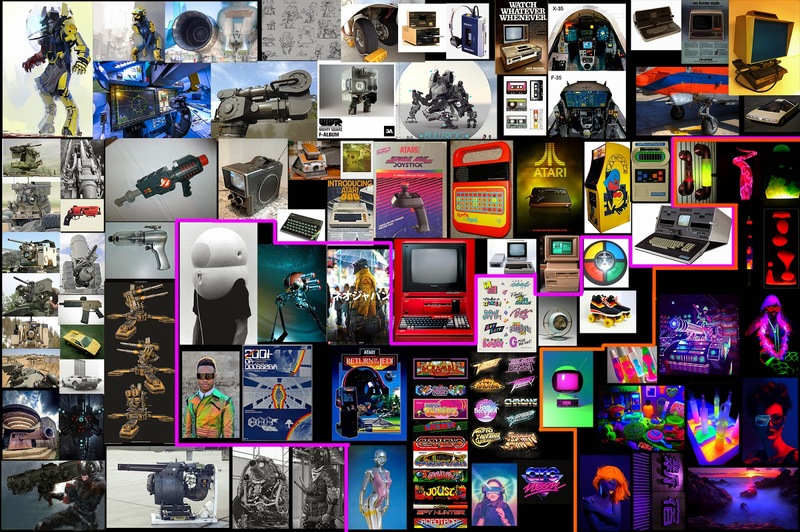 This second moodboard is grouped (loosely) into colour reference, retro computers, weaponry and other random 80s bits. 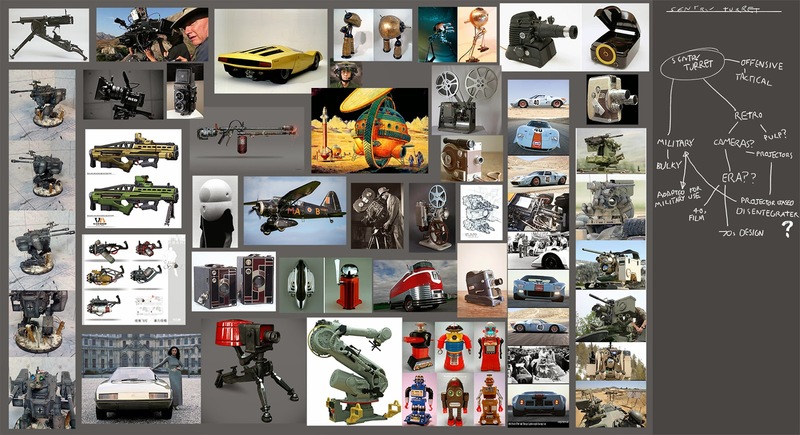 From this I began to develop a bash kit from the silohuettes for some simple thumbnail creation. 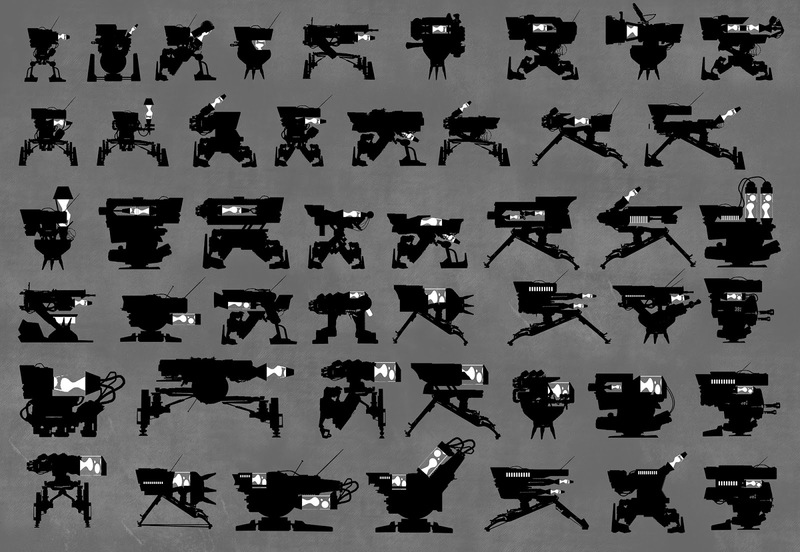 Then I used the bash kit and photoshop lasso tools to create a load of thumbnails for the sentry turret, I coloured the lit bits separately so they are distinguished from the rest of the thumbnail and makes it easier to read. First Week: Unreal 4! PBR! Other cool stuffs!